contacting a fake Netflix customer support line. Computer security experts are warning about an elaborate new tech support scam where thieves pose as Netflix and Microsoft employees to steal from unsuspecting victims. 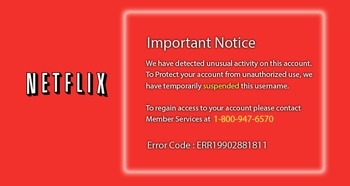 In the phishing scheme, potential victims’ login credentials are stolen by a fraudulent Netflix website. Scammers will then tell you that your account has been suspended for “unusual activity,” suggesting you call a toll-free phone number to address the issue. Of course, that phone number doesn’t connect to Netflix – it’s a direct line to a call center in India trained to trick you into giving hackers direct access to your computer. If you’ll let them, the scammers will not only steal sensitive files from your computer, but swindle you out of $400 to “fix” your hacking problem. The best way to avoid this scam is to know about it. It’s also worth investing extra caution when dealing with any kind of email alert about an account, online or otherwise. Don’t click on links in emails – type the company’s URL in your address bar manually. There are even more great tips in our guide to protecting yourself against online threats, helping you avoid all sorts of other scams. The full, winding details of the scam are available on the Malwarebytes Unpacked blog. You can see a walkthrough of the scam in the Malwarebytes video below.